It's been said that Hunted: Demon's Forge is a fantasy RPG resembling Gears of War, but now is your chance to see what you think of it yourself thanks to E3 unleashing the offical trailer. 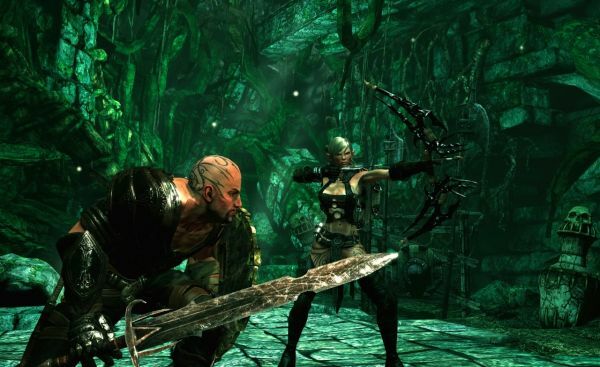 Hunted: Demon's Forge will have a cover system, two player co-op, and a world of fantasy adventure at your fingertips. What do you think of a flashy new co-op action RPG, complete with game mechanics that have never been seen in this genre before? "Taking control of either E’lara, a ranged weapon expert, or Caddoc, a master swordsman, you must use a variety of weapons, powerful spells, and cover tactics to battle your way through menacing dungeons, overgrown ruins, and downtrodden towns. Discover secrets and complete co-op-based puzzles whilst exploring the sinister world to discover answers to the game’s deep, dark mysteries." If the story stands strong, and the action/adventure style gameplay is as nice as it sounds, this could very well be one of the most addictive and complete fantasy co-op games in a long time. We'll be keeping an eye out for more news on this one, for sure.